AKIPRESS.COM - July 2014 marks the start of the annual USAID-sponsored Summer Democracy Camp program, implemented by the International Foundation for Electoral Systems (IFES), which has been promoting leadership in good governance among youth in the Kyrgyz Republic for over a decade, the U.S. Embassy in Bishkek said. During the summer of 2014, IFES will be organizing two camps in Osh and Issyk-Kul, with the support of USAID/Kyrgyz Republic. Camps will bring together 120 secondary school-age children and – under a new initiative – teachers from around the country. 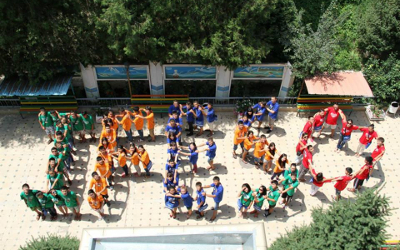 The IFES Summer Democracy Camp is a ten-day event that teaches young people critical thinking, leadership skills, and teamwork; exposes students to civic and democratic values; encourages civic engagement; and introduces the concept of project management – all through innovative, interactive tools such as games, art, role play, and the use of multi-media technology. Students are urged to design and manage a project that strives to improve an area in their respective communities or schools. The project development component of the camp experience allows alumni to share what they have learned and inspire others to find opportunities to be active citizens. This year, IFES is expanding the reach of the program by inviting local civics teachers to attend the camp in order to expose them to new, innovative methods of civic education and allow them to observe youth in a free-thinking and open-minded environment, under the camp theme, “Men Ozum Chechem” (I Decide Myself). When IFES first invited a handful of teachers to observe camp in 2013, teachers were amazed by the students’ creativity, self-sufficiency, and willingness to speak about their own ideas for improving civic engagement in the Kyrgyz Republic. IFES aims to expand teacher involvement and this year has put out an open call for interested civics teachers to apply to participate.